When Age-friendly NYC, a partnership of the Office of the Mayor, the City Council and the New York Academy of Medicine (NYAM) spoke to several thousand older adults throughout the city, many said that they were craving a place to cool off, to socialize and to get some exercise. 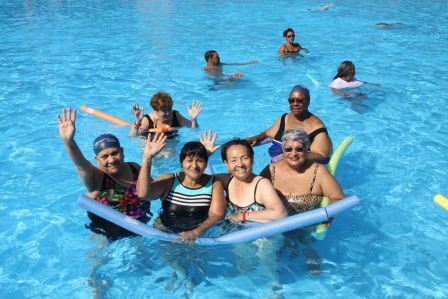 A pilot project, Senior Swim was developed in 2012 with one city pool, in which several hours a week were dedicated to seniors only for swimming and aquatic exercises. It was such a success the city extended it to 14 pools in 2013 and 16 pools in 2014 and 2015. Details on older people's involvement: The older adults attended the Senior Swim pool hours and brought their friends and neighbors to participate. Seniors who participated were very happy and looked forward to next year's program. Their health and their social well-being were enhanced. The seniors love Senior Swim. Some of the comments were: "After a fracture I felt weaker. Swimming helped a lot." "I am more flexible" "I have more energy and I look forward to coming even though the water is cold." "I am more happy and outgoing." "Its easier to relate and to make friends." "I can walk faster." "I feel overall better than at the start of the summer." Yes. The project started with 1 pool, then expanded to 12 pools the next year then to 14 pools the following year and then 16 pools. The city hopes to expand the program to more pools next year. It was a joy to work with many of the organizations and to hear their reactions of the announced pool hours. The parks Department was very accommodating and enjoyed working with the seniors as well. Good new friendships were created among seniors and park personnel (lifeguards included). There is nothing we would change to implement this project. The only obstacle to the project which presented a challenge was transportation to the pools for many seniors. A few senior groups organized car pools 9vans) but most took public transportation if not in a walkable distance.